Nearly a year and a half have passed since the founder and visionary for Atack Properties Inc. left his legacy for others to pursue. Robert “Bob” M. Atack, a philanthropist and a leader behind the explosive residential growth in western Henrico County, died at 66 from pancreatic cancer in May 2014 — but not before putting his business in order. “We have been very blessed; Atack Properties is busier now than in the past 40 years,” said his son, Richard “Cory” Atack. “Bob made sure that his families, his employees, his church and his charities were all provided for,” said James W. Theobald, chairman of the Hirschler Fleischer law firm in Richmond. Atack Properties is an asset of his estate. And at 4 p.m., also just about every day, he would call Cindy S. Weinstock, then vice president of Atack Properties. Weinstock, who has been with the company for 27 years, is now president of Atack Properties. Weinstock, whose mother worked in a factory and whose father was a painter, grew up in Mechanicsville and earned a bachelor of science degree in 1985 from Virginia Commonwealth University. Weinstock took two hiatuses from the company: one when her second child was born in 2000 and again in 2011, when she needed a break. “It was always known to me that if anything happened, he was planning on me coming back,” Weinstock, 52, said. “Bob was a salesman; I am more nuts and bolts,” she said. Even though Bob Atack was perfunctory about getting his business affairs in order, he wasn’t that way in general.“Bob was emotional,” Theobald said. Cory Atack, 43, is now secretary of Atack Properties and participates in decision-making for the company. However, until recently, he was never involved in development — buying raw land, putting in utilities and selling lots to builders. He heads Richard Atack Construction, a custom homebuilding company that he founded in 1997 in Henrico. He is building now in Henley, a high-end residential community developed by his father off Pouncey Tract Road. He’s the sole builder there now. The minimum lot size is 1 acre, but the houses are so big — from 7,000 square feet to 10,000 square feet each — that the lots look smaller. Atack Properties has developed more than 10,000 residential homesites mostly in Henrico but also in Hanover and Chesterfield counties since the firm was founded in 1985. Communities include CrossRidge on Staples Mills Road, a mixed-use community and one of the first in the area for people 55 and older, and the high-end Swanson Mill Run community off Mill Road in Henrico. Ryan Homes just finished building there. Atack Properties and Richard Atack Construction are run from the same building in the Innsbrook Corporate Center in Henrico. Seven people are employed by Atack Properties; five by Richard Atack Construction. Any development is typically years in the making, and much of what Atack Properties is doing now was started by Bob Atack. After he died, the company had an opportunity to pick up an additional 4.3 acres and add 40 town houses to the original proposal for 37 town houses at Bedford Falls. The land for the first phase of the project is being cleared, and construction is expected to start soon. At Broad Hill Centre, a 70-acre site west of Short Pump Town Center, Atack WB Investors, which is managed by Atack Properties, just sold a 2.2-acre tract to Aldi to build a store there. The store will be at least the ninth for the German-based discount grocer in the Richmond area. Bob Atack closed on an all-cash $6.75 million deal for the West Broad Street development site in October 2011. His plan was a mixed-used development — a plan that is coming to fruition. The site is just west of Broad Street Marketplace, where a Cabela’s outdoors goods store and Wegmans grocery store will be anchor tenants, and Broad Hill Centre is east of state Route 288. Bon Secours Richmond Health System purchased land at Broad Hill Centre for medical offices, including a free-standing emergency department and imaging center. Commonwealth Properties is putting up a 320-unit luxury apartment building. The first units are expected to open in February. Reston-based Stanley Martin Homes will build 166 condos there and 78 town homes are planned for the site. A national pharmacy chain — announcement pending — plans to take frontage on West Broad Street. 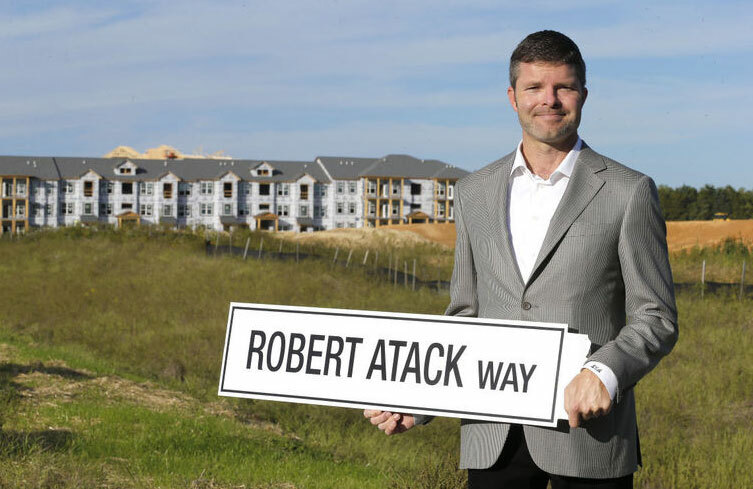 In addition to that development, Atack Properties sold its final section last year in Hunton Park, a 13-year project with about 700 residences — apartments, town homes, condos and single-family homes — off Staples Mill Road. Hermitage Town, a town house community off Wistar Road, is under construction. And the company is dusting off plans for The Ridings, a 500-acre tract off state Route 5 in Varina for a mixed-density residential community with equestrian themes and pedestrian trails. Bob Atack along with partners David and Christy Cottrell donated 87 acres in front of the property to the county. The parcels have sat untouched since the property was purchased in 2004 and 2005. “Timing is contingent on market demand, which could be a few years from now,” Weinstock said. Meantime, Mount Vernon Baptist Church on Nuckols Road in Henrico plans to open a 1,200-seat sanctuary next year, thanks in part to an irrevocable trust set up by Bob Atack. His favorite charity, also named in the trust, is Good Samaritan Ministries, a Christian ministry off Hull Street in South Richmond. “Bob Atack’s business and philanthropic endeavors made him a pillar of the community, and no one can ever replace him,” Weinstock said. “He is still with us in spirit and will always be the captain of our ship; I’m just serving as the navigator, striving to maintain the course he set for Atack Properties.